F1 supremo Bernie Ecclestone insists the sport does not need the British Grand Prix as negotiations continue over the hosting of the race from 2010. Donington's bid to stage the event looks over after the promoters failed to raise the £135m needed to host it. And Silverstone, the most likely alternative venue, is stalling over the terms of Ecclestone's contract offer. 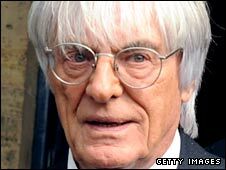 Ecclestone said: "I want a British Grand Prix, of course, but we are not going to do special rates for Britain." Silverstone has hosted every British Grand Prix since 1987 but in 2008 Donington, which has only ever held one grand prix, won the rights to the event. Donington's apparent inability to come up with the cash required to host the race has seen it offered back to Silverstone but the deal is thought to be similar to the one presented to, and rejected by, the circuit 18 months ago. Ecclestone told the Daily Express: "Silverstone have a contract in front of them. We've no commercial arrangement in place for a British Grand Prix for next year. "That is why the race has an asterisk beside it on the 2010 calendar. "If they can't make it work then don't do it. If that happens, there won't be a British Grand Prix. Simple as that. "No-one is forcing them to take it. This is business. We have offered them a deal." Ecclestone ruled out the prospect of Britain being given a discount rate, similar to those enjoyed by Monza and Monaco as the sport's "traditional" grands prix. He added: "The contract they have is the contract we like. We are not prepared to charge less. Do we need a British Grand Prix? No." Donington still has until midday Monday (1200 GMT) to meet the deadline set by Ecclestone for executives to prove they have the finances required to upgrade the aged track. The central England circuit had been set due to take over hosting rights from Silverstone next July in a 17-year deal. Earlier this month, Donington launched a bond issue in an attempt to raise £135m, but track operators, Donington Ventures Leisure Ltd, confirmed on Friday that it had been unsuccessful. The track operators added: "Despite higher than expected levels of interest and very positive early indications, the bond, which was launched with Citi Group last week, has failed to secure enough subscription ahead of the deadline."